Editing and searching PDFs on the Mac got a little easier on Thursday with Smile’s release of a major upgrade to PDFpen. PDFpen 5.0 introduces major new features like the ability to redact or erase text, even in OCRed documents. You can now search and replace or redact text, and forms you create can support list widgets and Web-based submit buttons. You can selectively change the resolution and color depth of a single image or the entire document to reduce a PDF’s file size. Performance has also been improved to better handle large documents. 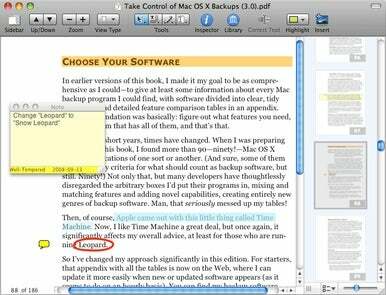 In addition to these new features, PDFpenPro also gained the ability to convert Websites into multi-page PDFs. This is on top of its existing advantages over the regular version, which include: creating cross-platform PDF forms and generating a table of contents. PDFpen and PDFpenPro 5 are available now for $60 and $100, respectively. Smile offers a 90-day money-back guarantee, and both editions have trial versions.